Artist's concept of an inflatable airship cruising through the skies of Saturn's huge moon Titan. 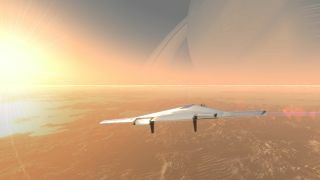 Aerospace firms Northrop Grumman and L'Garde have been developing a Venus-specific version of this vehicle called VAMP (short for Venus Atmospheric Maneuverable Platform). A big robotic airship could ply the skies of Venus for up to a year, giving scientists an unprecedented look at Earth's hellishly hot "sister planet," the craft's developers say. For the past year, engineers at aerospace firms Northrop Grumman and L'Garde have been working on an unmanned concept vehicle called the Venus Atmospheric Maneuverable Platform. Using a mixture of powered flight and passive floating, VAMP could stay aloft for long periods, collecting a variety of data about Venus and its atmosphere. "There are no major technology unknowns," Northrop Grumman's Kristen Griffin told SPACE.com in December at the American Geophysical Union's annual fall meeting in San Francisco. "It really is something that could be developed when the [scientific] community is ready for it." VAMP is a big but incredibly light inflatable aircraft. While its 151-foot (46 meters) wingspan dwarfs that of NASA's now-retired space shuttle, the triangular VAMP would tip the scales at just 992 pounds (450 kilograms). In the vehicle's envisioned mission architecture, VAMP hitches a ride to Venus orbit with a carrier spacecraft, then deploys and inflates (with hydrogen or some other buoyant gas) while still linked to this mothership. VAMP then detaches and spirals down toward the planet, hitting the atmosphere in a slow, smooth entry that requires only minimal thermal-protection gear. This critical maneuver would be far less dramatic than the August 2012 entry, descent and landing of NASA's Mars rover Curiosity, which space agency officials dubbed "seven minutes of terror," Griffin said. "This would be more like an hour and a half of trepidation," she said. VAMP would then cruise through Venus' skies at altitudes ranging between 34 miles and 43 miles (55 to 70 kilometers), using propellers to get high up during the day and floating passively at lower altitudes after sunset. Solar panels would power the craft's propellers, while night-time operations would be supported by batteries or an advanced stirling radioisotope generator (ASRG), which converts the heat produced by radioactive decay of plutonium-238 into electricity, VAMP's developers say. The airship could carry up to 44 pounds (20 kg) of scientific gear if scientists wanted it to fly as high as 43 miles. But a minute sacrifice in maximum altitude — just a mile or so — would allow VAMP to tote a 440-pound (200 kg) payload, team members say. Data gathered by the vehicle's onboard instruments would be relayed back to Earth via the carrier spacecraft, which would remain in Venus orbit. Many scientists are eager to learn more about Venus' atmosphere, as such knowledge may help them understand how the planet changed from a potentially life-supporting world billions of years ago to the scorching hothouse it is today. VAMP could help unravel some of the planet's most perplexing mysteries, serving as a sort of Venus "sky rover," said Griffin, who declined to provide a cost estimate for the concept vehicle. And VAMP-like airships could also find broader application, exploring other worlds as well, she added. For example, such aircraft could help deliver landers and rovers to the surface of Marsand cruise through the thick, nitrogen-rich skies of Saturn's huge moon Titan, which sports lakes of liquid methane and ethane on its surface. "You could do low-altitude flight at Titan," Griffin said.